The Chong Bongs are now harder and harder to find thanks to the feds confiscating most of them during the 2003 “Operation Pipe Dreams” raid, and, therefore, are collector’s items. A Chong Bong is a collectible hand blown glass bong with Tommy Chong’s face plastered on the side of the glass in caricature, with his famous headband and glasses everyone knows so well from his movies. They were made and sold by Chong Glass, a now defunct company run by the legendary Tommy Chong. Chong and his Bongs got into some hot water back in 2003 and the feds confiscated most of them in a raid. The story goes a little something like this; In 2003 over 2,000 law enforcement officers and $12 million dollars were spent on Operation Pipe Dream and Operation Head Hunter led by Attorney General John Ashcroft and U.S. Attorney Mary Beth Buchanan of the Western District of Pennsylvania. It was practically an all-out war on head shops selling “drug paraphernalia” otherwise known as Chong Bongs. After the sting ended 54 of the people apprehended ended up on probation and with community service, but Tommy Chong was made into an example and sentenced to nine months at “Club Fed” after accepting a plea bargain. There are many different points of view on how this whole thing unfolded when you peruse different articles on the web. One source says the feds, going undercover, ordered a large shipment of pipes to arrive in the state of Pennsylvania where it’s illegal to have them shipped. According to the source Chong and his company felt compelled to ship all the orders anyway since they were in such “high demand,” but this was only because of the law enforcement officer’s order to nab the unaware Chong in the first place. This gave the officers operating in the sting a “legal right” to apprehend 55 more people who sold Chong’s products in head shops online and off in different states throughout the US. You can check out a copy of the full indictment for yourself here. The Business Insider published an article in 2014 called, How Jordan Belfort’s Prison Bunkmate — Tommy Chong — Inspired Him To Write ‘Wolf Of Wall Street.’ While incarcerated Chong thought Belfort’s stories were so funny he encouraged him to write them all down. 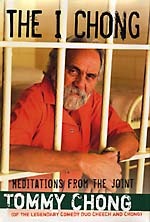 Chong even wrote his own book in the pen called: The I Chong: Meditations from the Joint. It’s now available and it’s about his side of the story of his arrest. Where to Find a Chong Bong? The Chong Bongs from these infamous days are now harder and harder to find thanks to the feds confiscating most of them during the raid, and, therefore, are collector’s items. The best way to find one is to search classified ads online or weed forums to see if anyone’s willing to part with theirs. Usually, prices go from $800 to $1400 each. If anything you can have a fun time looking at all the pictures of Chong Bongs on Google or on websites like theweedblog.com. You can see the latest version of water pipes on offer from Cheech and Chong at cheechandchongglass.com. Do you own a Chong Bong? How do you like it? Let us know in the comments section below.